Any plant operator has their own experiences of the problems caused by the failure of rotating machines. The downtime, the effect on production output and the cost of the repair or replacement gearbox, electric motor, pump can cause major problems as we all know. CPM Engineering are involved in supporting customers with a range of proactive and reactive repair services to rotating machines dependent upon the clients objectives. This gives us experiences of the type of failures which occur and a good level of understanding therefore of what measures can be taken to detect early fault conditions. But it’s perhaps our programme of sharing of Root Cause Failure Analysis (RCFA) with customers and through various engineering forums like LinkedIn and via trade associations that allows us to advise on practical solutions to avoid failures. One such instance we were involved in a Pulper gearbox removed from a paper mill as a result of increased levels of vibration detected as part of the clients own vibration analysis programme. On evaluation of the gearbox the failure was due to normal wear patters associated with the number of years’ service to which the gearbox had been subjected. The vibration readings were, in fact, measuring the effects of wear to a related bearing housing and seating. The vibration analysis did its job however secondary damage caused by this wear was significant and resulted in additional repair costs and longer time out of service. In our experience vibration analysis performed at regular intervals will detect such conditions as individual component wear. Defective bearings, misalignment, housing and shaft wear and even wear to gear trains when used as a trending tool can all be measured but in this instance the damage was already done. 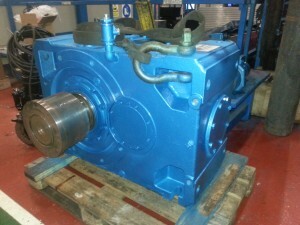 Even though forward planning allowed for the gearbox to be removed from service and refurbished with limited effect to production, the cost of repairs were significant. So, could the impending damage have been detected earlier before component damage occurred and therefore limit the repair scope and the time out of service? For instance, could oil analysis have detected the wear earlier? Sampling and analysing the condition of the lubricant in gearboxes can have an advantage over vibration analysis particularly at slower speeds. Measuring the metallic partials suspended in the lubricant can indicate early levels of wear however without an intimate knowledge of the constriction of the gearbox it will not detect which component is worn. In addition oil analysis can detect moisture, changes in viscosity, contamination and the general condition of the lubricant. For more information on this article contact CPM at 0161 865 6161 or info@cpm-uk.com.